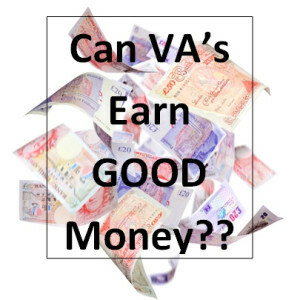 / Can VA’s Earn Good Money? 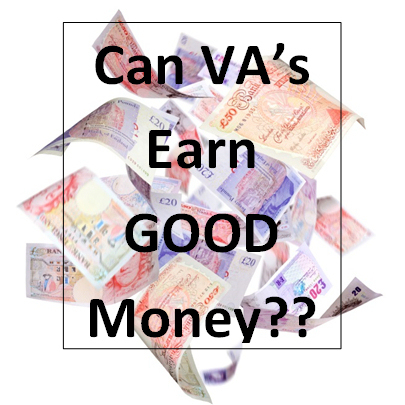 Can VA’s Earn Good Money? VA’s can earn great money – you just need to know how. One of our blog subscribers posted that exact question recently. It seems to be a question that comes up time and time again for those considering taking their skills online. They fear that they won’t be able to earn enough money working online as a virtual assistant. I’ve even heard some people ask if Virtual Assistant roles are SCAMS!!! So Can VA’s Earn Good Money? In fact a skilled Virtual Assistant can earn GREAT MONEY! There is a lot of earning potential in the working virtual industry. Your earnings really depend a lot on YOU. Your skills, talents, experience, how much you’re willing to network, how much you’re willing to invest in yourself and your business and how much commitment or staying power you have. There are a number of factors you will want to consider and a few questions to ask yourself if you’re planning a virtual assistant career path and want to know how much you can really earn as a virtual assistant. There are virtual assistants who have grown their business by setting up systems and hiring a team so that their business is generating a 6 figure + income. At the same time there are Virtual Assistants that are working offshore for a very low hourly rate. I’ve seen some offshore assistants on elance working for as little as $5-$7 per hour. There are, of course, virtual assistants that are charging reasonable rates from $20-$60 per hour, but they don’t have enough clients which is lowering their overall income rate. Most Virtual Assistants that I have worked with charge from $12 per hour to $30 per hour. How much you expect to earn. Do you see your service as truly adding value to the client? How much value are you offering? You need to know the answer to this, so you can charge with confidence. If you under-value yourself your earning potential instantly lowers. Your skill level and the specialised skills your offering. The higher your level of expertise, the more you can earn. The more specialised your service, the more you can charge. As an example a virtual customer service position will not draw in as much dollars as would an online project manager. What Could Stop Virtual Assistants from Reaching Their Earning Potential? Giving up too soon, without allowing time for their business and reputation to develop.